[Satnews] The new EXPLORER 540, Cobham SATCOM’s latest addition to its established EXPLORER range of satellite terminals, has now been introduced as the world’s first Machine-to-Machine (M2M) communication terminal to operate on both Inmarsat BGAN (Broadband Global Area Network) and 2G/3G/GPRS networks—the EXPLORER 540 may be seen for the first time on Cobham SATCOM’s booth (#603) at OilComm 2015 in Houston. For organizations transferring business or safety critical real-time data within their M2M networks, EXPLORER 540’s dual mode can provide unmatched service availability. Designed to deliver real-time M2M communication for diverse applications including IP SCADA for data backhaul, asset tracking, real-time surveillance and remote telemetry, EXPLORER 540 brings with it the same operational reliability that has helped to establish EXPLORER as a leading name in the land mobile BGAN and VSAT sectors. It is based on the latest generation EXPLORER technology platform, introduced with the EXPLORER 510 BGAN terminal. “Resilience being the key parameter within M2M communication, our prime design goal has been to provide the most reliable yet versatile BGAN M2M terminal in the market. By leveraging our field proven technology platform, EXPLORER 540 delivers intrinsically safe support of BGAN M2M with standard BGAN rate plans and the added unique benefit of dual mode BGAN & 3G operation,” said Henrik Nørrelykke, VP Land Business, Cobham SATCOM. Also at OilComm 2015, Cobham SATCOM will show its new, cutting-edge range of super-light, compact Ka-band VSAT antennas to the Oil & Gas industry for the first time. The company's all-new SAILOR 60 GX and SAILOR 600 VSAT Ka are based on a unique high performance Ka-band VSAT platform designed to deliver best in class performance on Inmarsat’s new Global Xpress® network world-wide or on Telenor Satellite Broadcasting’s THOR 7 High Throughput Satellite (HTS) services in Europe. Sharing the same advanced design and lightweight carbon fibre composites/aluminum construction, the SAILOR 60 GX and SAILOR 600 VSAT Ka weigh just 82 lbs/37 kg. While being some of the lightest Ka-band antennas in the 60cm class, both retain the performance and reliability of larger SAILOR VSAT and GX antennas, already recognised as leading technology solutions for maritime broadband. For offshore vessels with space restrictions, SAILOR 600 VSAT Ka and THOR 7, and the combination of SAILOR 60 GX, SAILOR FleetBroadband and Inmarsat Fleet Xpress meet the demand for fast, reliable connectivity and voice calling to support operational and crew communication. Joining the extensive Cobham SATCOM VSAT antenna portfolio, which already includes 100cm (39.37 inches) class antenna systems for Inmarsat and Telenor’s new services, the smaller, lighter SAILOR 60 GX and SAILOR 600 VSAT Ka are easily lifted or carried on board for installation. This can reduce costs significantly and the use of modern, lightweight materials that make easy handling possible, does not affect link performance. In fact, like all SAILOR VSAT antennas, SAILOR 60 GX and SAILOR 600 VSAT Ka offer class leading RF radio performance, which ensures high reliability and availability of broadband on board. 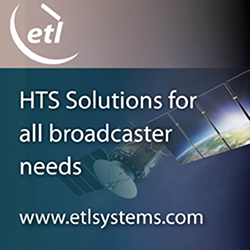 The SAILOR 60 GX and SAILOR 600 VSAT Ka also introduce other significant installation benefits, especially for smaller offshore vessels and workboats, which can now operate smarter through harnessing the power of HTS services. The optimal size/performance balance of Cobham SATCOM’s new antennas is possible because HTS services use spot beams instead of wide beams, so with advanced engineering and software design, they can operate anywhere in the satellite footprint and provide a strong link to the satellite. Installation of both new antenna systems is easy, thanks to a wealth of features and details unique to the SAILOR VSAT technology platform, including a single cable between antenna and below deck equipment for RF, power and data, Automatic Azimuth Calibration and Automatic Cable Calibration. Both antennas come pre-configured for their specific satellite network, which enables ‘one touch commissioning’, meaning they can be online in seconds with no requirement to contact the Network Operations Centre (NOC). Additionally, the use of Dynamic Motor Brakes inside the antennas removes the requirement for mechanical brake straps, ensuring antenna balance in no-power situations at sea or during transport. A third entry from Cobham SATCOM at OilComm 2015 is the firm's new, one meter EXPLORER 8100 Auto-Acquire Drive-Away for vehicular installation—this is the only antenna of its kind to use stabilization technology—even if the vehicle it is installed on moves, it retains a strong link to the satellite. Aimed primarily at Oil & Gas exploration and news media users, EXPLORER 8100 VSAT offers unparalleled performance and network access, ensuring availability of data and voice connectivity on any Ku- and Ka-band networks. With EXPLORER 8100, Cobham SATCOM has focused on ultra-reliable connectivity even in situations where the vehicle is experiencing sudden movements or rocking on its suspension while the antenna is transmitting. This could be caused by high winds or more commonly, people stepping in or out of the vehicle. Particularly important for Ka-band usage, mechanical impacts as small as 0.3 degrees may lead to an immediate loss of signal. Cobham SATCOM deploys ‘Dynamic Pointing Correction’ from its stabilized Maritime Antennas on EXPLORER 8100 to ensure uninterrupted transmission when similar antennas would experience a complete loss of signal. EXPLORER 8100 VSAT uses a state-of-the-art RTM carbon fiber reflector for impeccable precision, and when combined with pointing correction technologies, it delivers the most accurate Drive-Away VSAT antenna on the market. EXPLORER 8100 also features industry-fast satellite acquisition with pointing achieved automatically in less than two minutes, so field exploration teams can be stopped and online quickly and easily. The system is available in both Ka- and Ku-band configurations and works with all major satellite networks. A swappable feed system allows users to change frequency bands, ensuring they have full choice of what services to use throughout the lifetime of the antenna. EXPLORER 8100 comes with built-in Wi-Fi for easy access to the terminal and the same Web-based user-interface developed for Cobham SATCOM’s cutting edge Inmarsat GX series of antennas. Once connected, EXPLORER 8100 provides high performance, continuous connectivity in the field, optimally supporting high definition video streaming and high throughput data transfer, giving field engineers a reliable, high-bandwidth capable tool for collaborating with colleagues remotely.